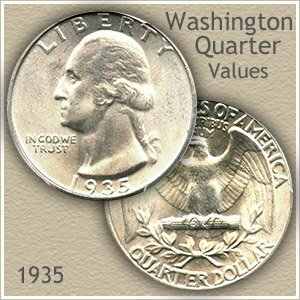 Your 1935 quarter value starts a $2.80 each. This minimum represents the high silver content in the coin. The Philadelphia mint did not use a mintmark, issued the highest total amount of quarters in 1935 and are today the most commonly found. The 1935 quarter pictured is an outstanding example of a coin that has never circulated. 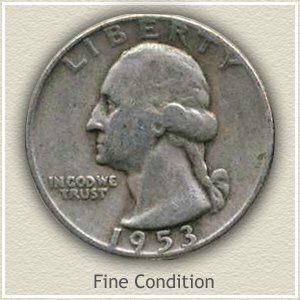 In this condition, known as "Uncirculated" or "Mint State" it is worth considerably more than the minimum silver value. 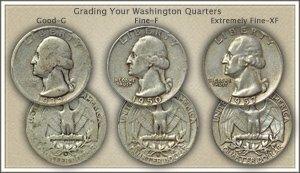 For example, "1935-D" is a Washington quarter minted in 1935 at the Denver mint, and prices are given for different degrees of wear, known as "Grading." And for a better understanding of Grading, see the section below. From brand new condition to very worn, is reflected in the examples. Line your quarters in a row, judge their state of preservation and assign each a "Grade." As you proceed handle each coin carefully, keeping in mind, value is highest for "Uncirculated" coins. 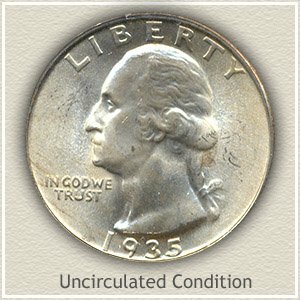 Uncirculated: Untouched since being minted and no wear on its surfaces, a quarter in this condition reaches the highest 1935 quarter value and is avidly sought by collectors and dealers. Admittedly few survive this nice. Good: The rim envelops the lettering to a degree but stops about a third of the way. The portrait is distinct and most of the prominent details remain. 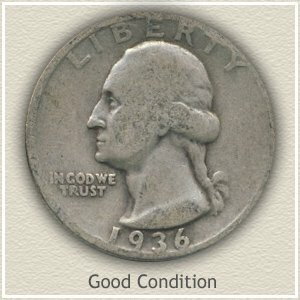 A 1935 quarter typical of this condition trades at its underlying silver bullion value. Including more about your 1935 quarter value. 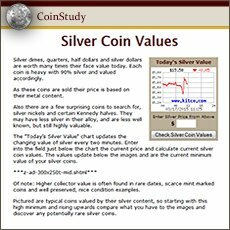 Easily find the value of your old coins. 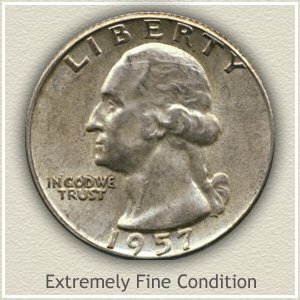 Rarely is a 1935-D quarter consigned to an auction as nice as the one that appeared in a Heritage Auction Galleries sale. Unspoiled surfaces and intact luster covering the entire coin. Attractively toned and barely a contact mark. All added up to a selling price of $4,888. Coins of this level of condition represent the highest 1935 quarter value. 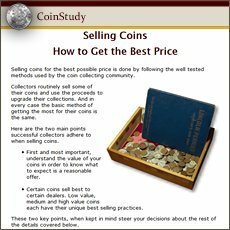 Today dealer and auction inventories are well described, with multiple coin listings covering many price ranges. See how your coins match up in condition and value.